As summer draws to a close, the gloom that kids feel is almost matched by the glee of parents who no longer have to worry about entertaining them 24/7 during the long weeks when school is not in session. Since youngsters wind up spending a lot of time in school, it’s not surprising that a wide variety of pop culture revolves around it. To help ease the back-to-school transition, some A.V. 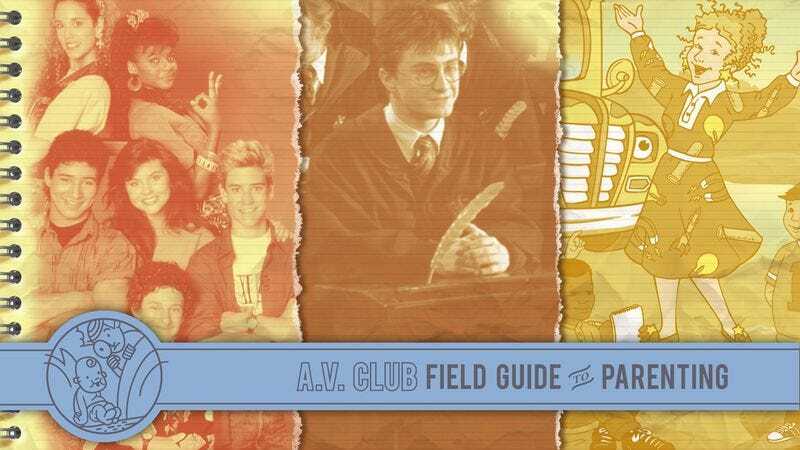 Club parents offer here their favorite school-related books, movies, and TV: a few exemplary PBS shows, some unusual book series, a look at Harry Potter’s academic schedule, and one father’s futile attempt to get his kids to think he’s as cool as Zack Morris. C’mon, Rick, nobody is. In 1986, Scholastic Books tasked two of its writers, Joanna Cole and Bruce Degen, with creating a book series to get kids revved up about science. Craig Walker, then senior editorial director at Scholastic, told Publishers Weekly: “I remembered as a child loving to go on field trips. So I thought about doing books about kids going on field trips to places they really couldn’t: through a water system, to the bottom of the ocean, inside the Earth. And I remembered an eccentric second-grade teacher in my school who everyone thought was the best. She brought everything imaginable into her classroom—even a teepee—and had every corner, ledge and windowsill filled with things. So that is where Ms. Frizzle came from.” The series started with an exemplary series of 10 picture books, as the Magic School Bus traveled to the center of the Earth or the farthest reaches of the solar system, dropping loads of factual information along the way. Scholastic then segued the book into a variety of formats, so that a trip to the bottom of the ocean in a chapter-book version could offer even more information with multiple sidebars and graphics. The Magic School Bus series accomplished what Scholastic first set out to do: make science explorations into the most fascinating journeys of all, aided by a delightful guide and her brood made up of kids any grade-schooler could identify with. The first Harry Potter novel came out a few years before my first child was born, and during those early months of 2 a.m. feedings, I’d often get up with my wife and read the books aloud to her, to make nursing less of a chore. I enjoyed the series immensely, but somewhere around Harry Potter And The Goblet Of Fire, I realized something: I cared a lot more about the school year at Hogwarts School Of Witchcraft And Wizardry than I did about the actual witchcraft and wizardry. I’ve been an anglophile nearly all my life, which means I find J.K. Rowling’s long descriptions of British private school clubs and prefects absolutely fascinating. But I’ve also always liked stories about school, in every medium—from John Hughes movies to Degrassi Junior High. My kids are the same. My son doesn’t read much fiction, but he plowed through the Wimpy Kid and Wayside School series when he was younger; and my daughter has read each of the Harry Potter books at least three times. It was ingenious of Rowling to structure a fantasy epic around the academic calendar, for a couple of reasons. For one, it allowed her original readers to age along with her characters, following Harry and Hermione and the rest as they matured into young men and women—with interests beyond getting good grades and fighting evil. But also, because school is such a common experience, Rowling could ground her magical world in something real, and relatable. It may be hard to understand what’s going through a youngster’s mind when he rides a broomstick for the first time, but shopping for school supplies and cramming for tests? That’s pretty universal. Sid is unusual for a kids show in that it follows our character through multiple settings. Like The Bob Newhart Show or Mary Tyler Moore, we see Sid’s home and work (school) life, and his interaction with two different peer groups. A typical episode starts with a problem or a question at home, which Sid’s earnest, intellectual parents explain. Then mom takes him to school, where he sees his three classmates: sensitive May, boisterous Gerald, and levelheaded Gabriela. (The student-teacher ratio at Sid’s school is outstanding.) Teacher Susie takes them through a lesson, which invariably ties into the question Sid had at home. Then Sid’s grandma brings him home, and he talks to the audience about what he’s learned. As my sons inch closer to the school year with the enthusiasm of cats being driven to a waterpark, they’ve become interested in what high school was like when I was young. Was I cool? Did I play sports? Was I a hit with the ladies? Why should my boys know I was a 98-pound wimp who slept with a stuffed Grover when they can envision me as a beautiful rogue with great hair and the ability to stop time? I sat them down for a viewing of Saved By The Bell, which I assured them was a completely accurate portrayal of my culturally diverse friends and me. SBTB aired from 1989 through 1993. It was a retool of a Disney Channel series called Good Morning, Miss Bliss and followed the lighthearted exploits of nerd Samuel “Screech” Powers (Dustin Diamond), cheerleader Kelly Kapowski (Tiffani Thiessen), jock A.C. Slater (Mario Lopez), activist Jessie Spano (Elizabeth Berkley), rich girl Lisa Turtle (Lark Voorhies), and my faux dopplegänger Zack Morris (Mark-Paul Gosselaar). A few hapless adults like Principal Belding (Dennis Haskins) were thrown in to hand out advice and catchphrases. The show was wildly popular among sheltered Midwesterners like me and spawned a few spin-offs and made-for-TV movies, a pop-up restaurant, a mean-spirited book, and even a potential felon. It was extremely safe and milquetoast and rarely delved into any realistic high school situation other than dipping a toe into drug use (caffeine pills!) and divorce. Exactly the kind of depiction I want my sons to believe in until puberty ruins them. As an introduction, I chose the classic “Dancing To The Max” episode where Zack and Slater fight over Kelly as their dance partner for a contest hosted by Casey Kasem. Crappy dancer Zack ends up with Jessie, Lisa ends up with Screech, we are all introduced to the winning dance called “The Sprain,” and everyone is in bed by 8:30. The moment the black bars of the 4:3 aspect ratio appeared on our TV, we were doomed. Before the painfully ’90s intro was over, I had to physically restrain my 6-year-old from escaping. My boys hated the awful dialogue, Day-Glo clothes, and canned laughter. I tried to steer the conversation to guy Zack Morris. Wasn’t he cool? How about those straight teeth? Doesn’t he remind you of a certain dad? As a parent, it’s all too tempting to see your kid as an excuse to say, “Finally, a chance to take someone who doesn’t know any better and get them to like the stuff that I like!” This is, of course, precisely what you should do. Every once in a blue moon, though, it probably couldn’t hurt to try something that neither of you knows about but that both of you find intriguing, which is how my daughter and I landed on Sideways Stories From Wayside School, by Louis Sachar. It’s not easy to liken the three Wayside School books—the other two being Wayside School Is Falling Down and Wayside School Gets A Little Stranger—to anything else of their era, but there’s definitely an element of Roald Dahl in their DNA. The school itself is 30 floors high, with one classroom per floor. But there’s no 19th floor, which makes things a little tricky when it comes to explaining the purported existence of Miss Zarves, whose classroom is ostensibly on that floor… except it isn’t, because she doesn’t exist. Got it? Probably not, but there’s a lot of material within these stories that’s full of similar wordplay that will make parents smile and possibly send kids into giggling fits. There are also thoroughly bizarre characters like Mrs. Gorf, a teacher capable of turning children into apples by wiggling her ears and sticking out her tongue, and Ms. Wendy Nogard, a substitute teacher who can read thoughts with the third ear hidden atop her head. Don’t worry, though: There are plenty of (relatively) normal kids in the mix that your own kids are likely to recognize as resembling their own friends.